A large part of the Granite State Minerals operation relies heavily on this piece of earth. 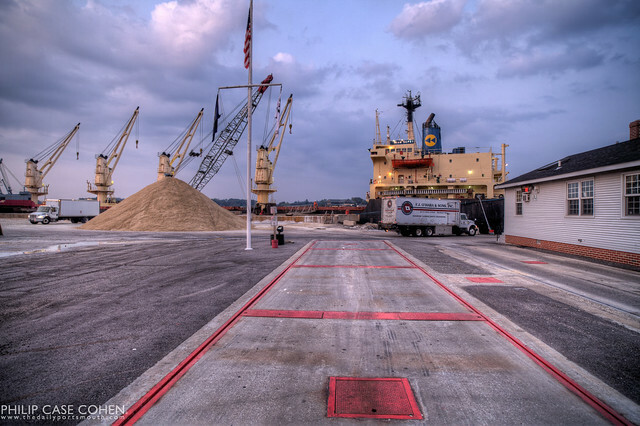 The sand/salt that is delivered and then loaded into trucks and shipped has to be weighed before it can hit the road. I was struck by the view on my way home this afternoon, with the pastel colored sky and the size of the sand/salt piles as they grew. I didn’t feel like changing the lens I had on my camera so I ended up with this wide angle shot that captures the view from the Market Street entrance and lens some scale to the scene.